Insects are a wonderful topic of study for spring. For this reason, my kids and I have been doing a number of activities focused on insects in recent weeks. 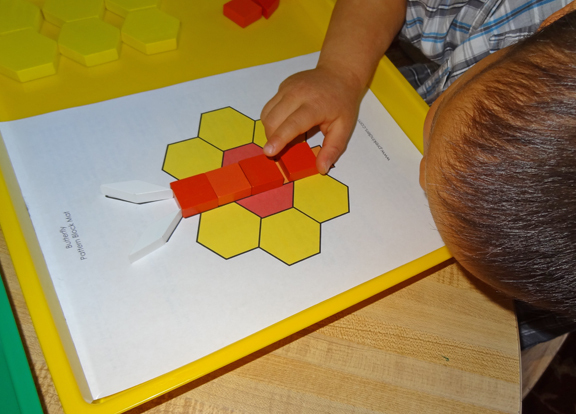 Among the insect learning activities I have prepared for my kids are activities focused on shapes, colors, fine motor skills, and more. Note: For more resources, printables and activities related to insects, please see my insects unit study page. 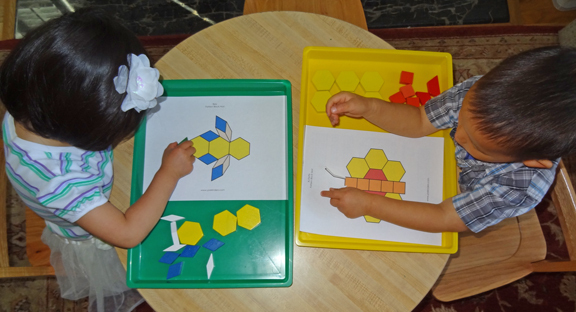 I found some wonderful, free printables from PreKinders that XGirl and QBoy used to create several different insects with our wooden pattern blocks . 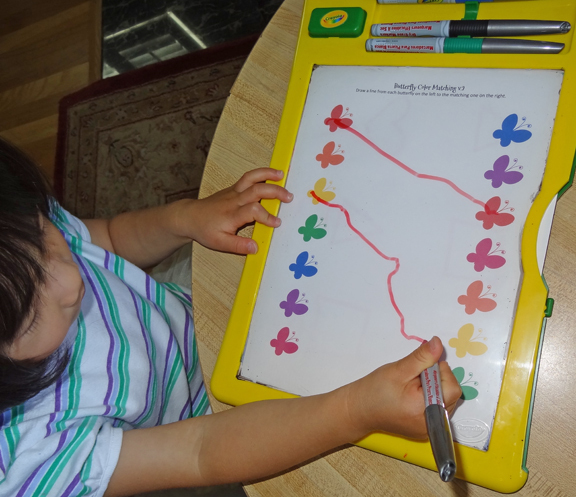 XGirl worked on color matching and fine motor skills using this Butterfly Color Matching worksheet from my Insects Printable Pack. Because I wanted to be able to reuse the worksheets, I inserted them into our new Crayola Dry Erase Activity Centers. The kids have loved using them, and I find these to be easier than laminating every sheet. QBoy worked on visual discrimination with this ladybug-themed Which One is Different? worksheet from my Insects Printable Pack. 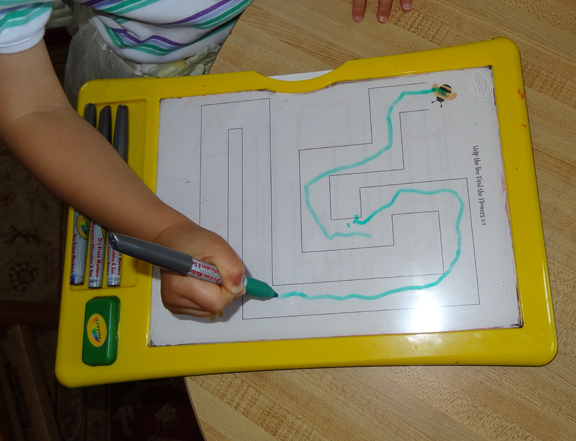 XGirl did some pre-writing practice using this maze worksheet from my Insects Printable Pack. 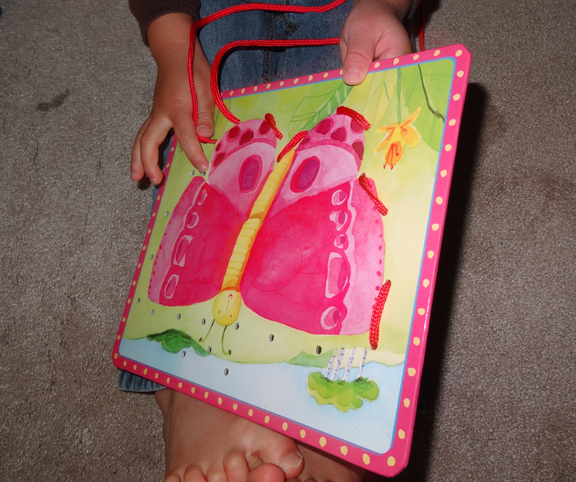 I picked up these Friendliest Bug Lacing Cards at a second hand shop a while back, and this was the perfect opportunity to bring them out for the kids to get in some fine motor practice. And of course, I couldn’t do an insects unit without introducing the kids to a favorite snack from my childhood – ants on a log! 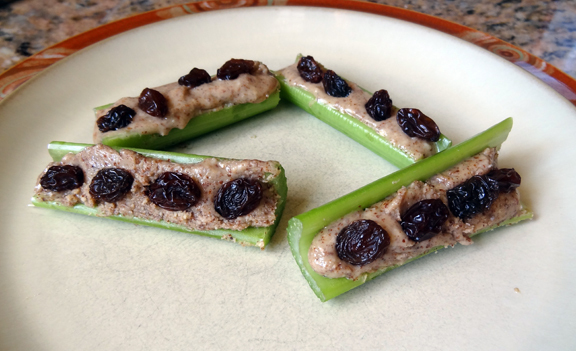 I put almond butter (but you could use peanut butter or sunflower seed butter) on sticks of celery to make the “log,” then added raisins on top to create the “ants.” The kids thought these were so funny and they gobbled them up! Try having them make the head, thorax, and abdomen out of a variety of kinds of candy. We used that piñata candy and left-overs from Easter for a 3D insect. They created names.. Maltomillispreed. So funny. They glued the stuff to cardboard 4×6’s. it really helped them cement the idea do 3 body parts, antennae, compound eyes, 6 legs etc. print an insect body PDF with the part names first. It helps them. And we sing, “Head, thorax, abdomen, abdomen.” To the tune of head shoulders knees and toes. They touch the parts and pretend they have antennae above their eyes with their fingers. I chart the words for my littler ones for guided reading and writing. Love these ideas Samantha! Thanks so much for sharing them! My daughter *LOVES* to sing and can memorize just about anything that is sung, so I know the “Head, Thorax, Abdomen, Abdomen” song would be a hit with her. Lacing cards and geometric tangrams are two great kid activities. I love that you connected them with a theme and healthy snack. So glad I found your site! 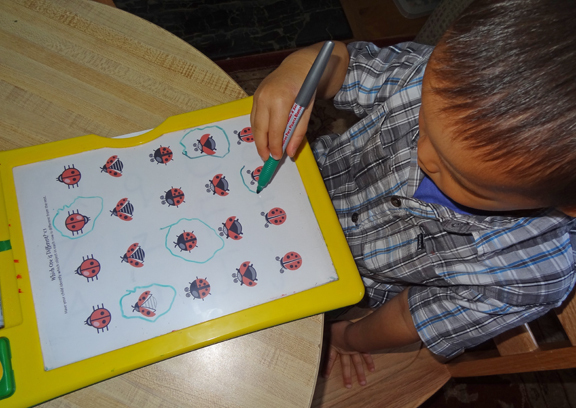 We are doing a ladybug theme next week and your printables are adorable. I just pinned them, thanks! Glad we could provide some inspiration! 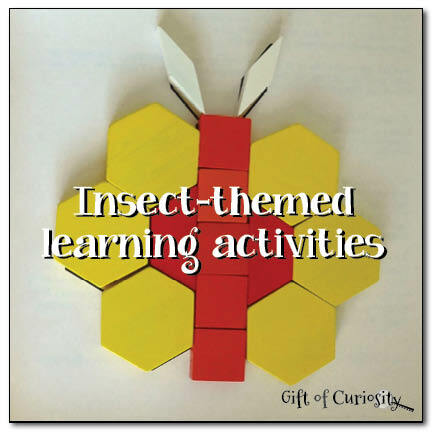 There’s a lot of great resources out there for an insect theme! This is perfect timing as today we went on a bug hunt. There’s so many great ways to use pattern blocks! This post has been selected to feature on my Hearts of the Home Blog Hop post due to go live tomorrow. Congratulations! LOVE your activities! Thank you for posting your ideas and links. 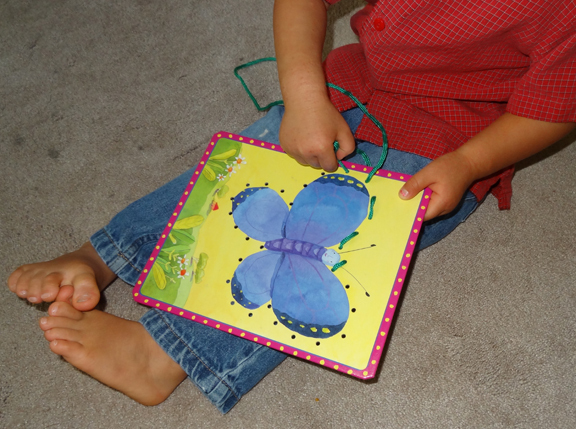 I downloaded the pattern block printables and your Insect Pack. Thank you for letting the homeschooling world (and others) have it free!